In Arizona, this is the season of “picking up the mesquite pods” that fall from the tree. Morning and evening, I pick up pods to try to keep up with the shower of pods from that day. Recently someone was telling me about mesquite flour, and the careful process of extracting the flour from the pods, and then making mesquite bread. In the store, mesquite flour is very expensive and has a kind of sweet, nutty taste, with a high protein content, when made into bread. Bread has been a staple of human diets for thousands of years, perhaps tens of thousands. All kinds of breads in all kinds of places, throughout history, have helped keep us alive. Can’t you just smell it baking, right now? I love fresh bread, and would eat fresh bread every day, if it was easily available―and if I didn’t have to think about the carbs involved! In worship on Sundays and at Soul Station on Wednesdays, we’ve been talking about Jesus being with us, as our hope for now and the future. We’ve talked about remaining connected to Jesus, as the one who shows us the way. Shows us the way to what? For me, Jesus shows me the way to life, life in all its joy, peace, hope, even in the midst of challenging or frustrating times. I find Jesus’ life in prayer, Scripture, conversation with friends, in worship, in laughter and in nature. Yet there is one clear way that Jesus’ life becomes deeply known to me, and that is in the breaking and sharing of bread. 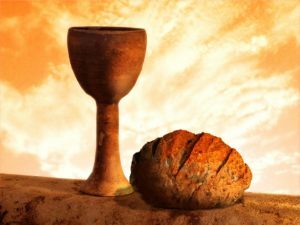 When Jesus institutes Holy Communion in Scripture, he takes bread, and says, “This is my body, given for you … broken for you.” When we receive that bread that has been blessed, it is a presence of Jesus’ life for us, taken into us, working in us, forgiving us. And then it strengthens us, to BE Jesus’ life in the world. Of course, in Holy Communion we also have the cup, of wine or juice, also a sign of the life of Jesus that is poured out for us. But today I’m thinking about bread, and the power it has to bring and sustain life—like Jesus. This Sunday, July 1, we’ll celebrate the appointments of your pastors, hear a message about Jesus being with us always, and share in the bread and cup of Holy Communion. See you in church! Don’t forget to wear your name tags, so Pastor Stuart Salvatierra can get to know you.